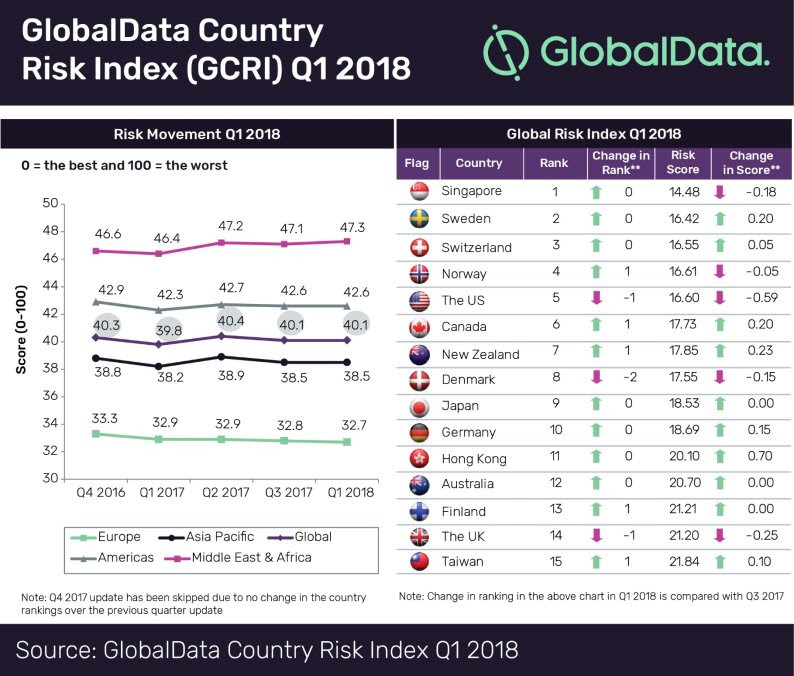 According to the latest results from the ‘Country Risk Index’ (GCRI) compiled by GlobalData, a leading data and analytics company, the overall global risk score remained flat at 40.1 out of 100 in Q1 2018 – unchanged from Q3 2017, following a reduction from 40.4 in Q2 2017. 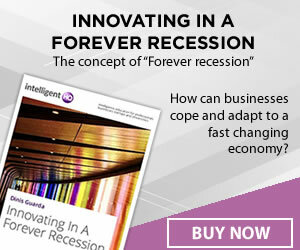 The company’s index is a unique country risk-rating model that determines the existing and future level of country risk, by assessing various qualitative and quantitative parameters. The index is formulated to help companies prepare their global business strategies by analyzing the risk parameters pertaining to political, economic, social, technological, legal and environmental factors. The latest GCRI results for Q1 2018 versus Q3 2017, reveals a number of interesting insights about the risk scores of individual countries and regions. Overall, Europe witnessed a reduction in the risk score (32.7 in Q1 2018 vs 32.8 Q3 2017) on an improved economic outlook where the region is expected to grow at the modest rate of 2.3% in 2018. However, the risk increased in Greece, the Czech Republic and the UK (where Brexit and cuts in public expenditure are set to impact the country’s rankings). The Asia-Pacific region’s risk score remained unchanged where major Asian nations, including India (7.7%), China (6.8%), the Philippines (6.8%), Indonesia (5.0%), Thailand (4.8%) and South Korea (2.8%), accelerated their economic growth. The Japanese government’s fiscal intervention with a US$17.8bn stimulus package in September 2017, and the recently signed trade deal with the EU are expected to drive Japan’s economic progression over the next few years. In April 2018, the leaders of North and South Korea pledged to end a 70-year old war which will reduce the political risk in the region. North Korea’s commitment to the US to denuclearize and the subsequent lifting of sanctions will significantly improve the economic prospects of the country and the region. The risk score of the Americas also remained unchanged in Q1 2018 compared to the previous update. The overall risk in the US and Venezuela increased in Q1 2018 driven by the Trump administrations global trade war and Venezuela’s ongoing economic crisis. The impact of the US$1.5 trillion income tax package is expected to drive the economic growth rate of the US in the remaining quarters of 2018. The Middle East and African (MEA) region witnessed an increase in its risk score in Q1 2018, on the back of heightened geopolitical risk led by the Qatar crisis, the Yemen conflict, sanctions on Iran along with a weak economic performance. Due to production cuts in OPEC oil, the GDP growth rate in Saudi Arabia and Iran is anticipated to slowdown in the coming quarters. The Great Bitcoin Collapse - The Dawn of a New Era?